From professional sports to leagues for kids, organizing a team or league is far more complicated than some assume. Think about the wide range of sports available. Now narrow that down to the variety of levels and skills. Thousands, if not millions, of sporting teams exist throughout the world, and they all require coaching, team members, fans, and people in charge of scheduling and organization. Even if this means that parents need to take on some responsibility. Although professional sports teams may consider hiring a developer to build a site from scratch, it’s not uncommon for the average team to look for a theme. 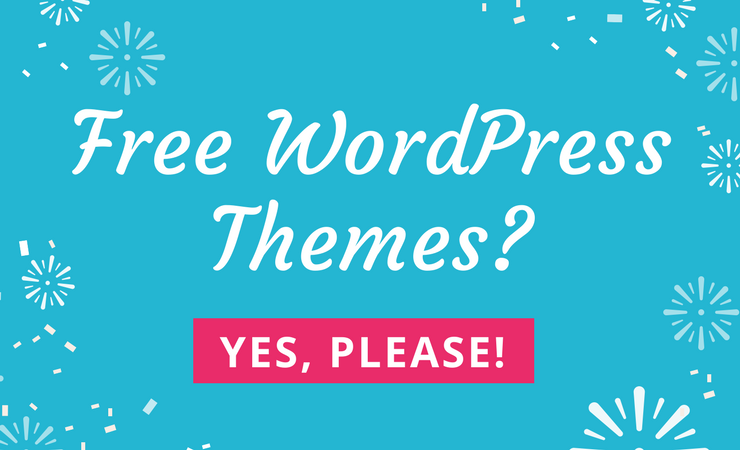 This includes examining free sports WordPress themes, which are ideal for building a blog, scheduling, sharing photo galleries, and getting fans on your email list. This way, no one has to spend any money, yet you still push content to the fans, team members, and anyone else involved with the organization. 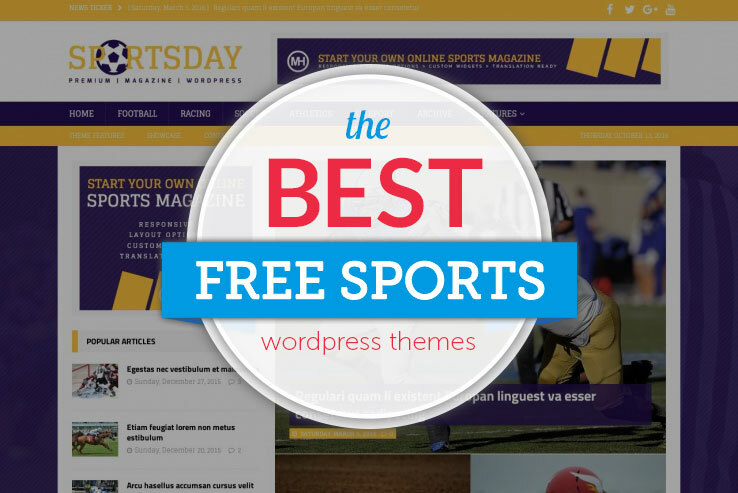 What Should Come With a Free Sports Theme? It depends on what type of sporting website you’re making, but it’s safe to say that you would need a blog, schedule, and potentially a place to sell merchandise or tickets. A sports publication should look for high quality post formats and ad spots, while actual sporting teams need support for multiple WordPress plugins. For example, you can make beautiful galleries and schedules, while also selling tickets with the help of additional plugins. What Sports Teams and Organizations Would Benefit from a Theme? Entrepreneurs and writers trying to make sporting magazines might find that the free themes are great to start out with. We also like the free themes for little leagues and school-funded teams. This way, you don’t have to spend much money to get the word out about schedules and team rosters. We also like some of the themes for full sporting eCommerce shops, since a few of them integrate with WooCommerce, making sales a little easier. The FitRun presents a design that’s full of energy and color, using a large slider module for showcasing photos, along with several options for eCommerce support. 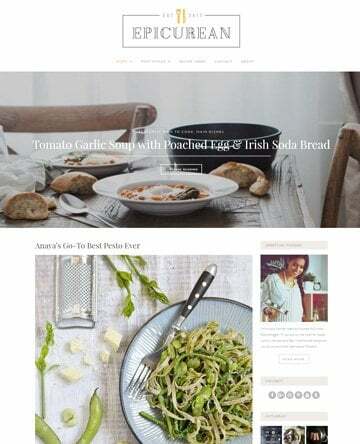 For example, you can connect the theme to WooCommerce and Ecwid, both of which launch online stores through WordPress. Built on the SMT Framework 2.0, the FitRun theme provides a dynamic content loader and custom sidebars. The sidebars combine with custom widgets. Shortcode plugins work with the theme, and you even receive a built-in Google Maps shortcode, perfect for merging with your contact form. 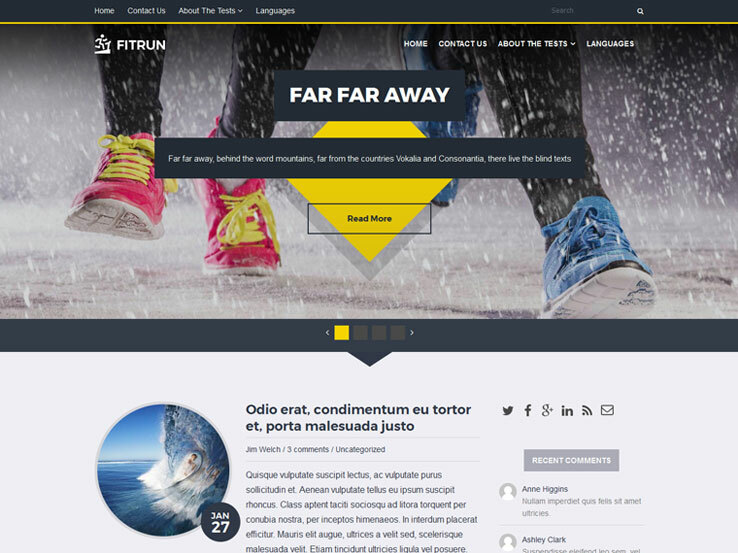 Overall, the FitRun theme has a responsive design, with a social sharing bar to bring people to your site from Facebook and Twitter. The translation options boost potential reader counts, while the slider serves as one of the smoother options on the market. Along with custom menus, antispam and related posts, the FitRun theme stands out. 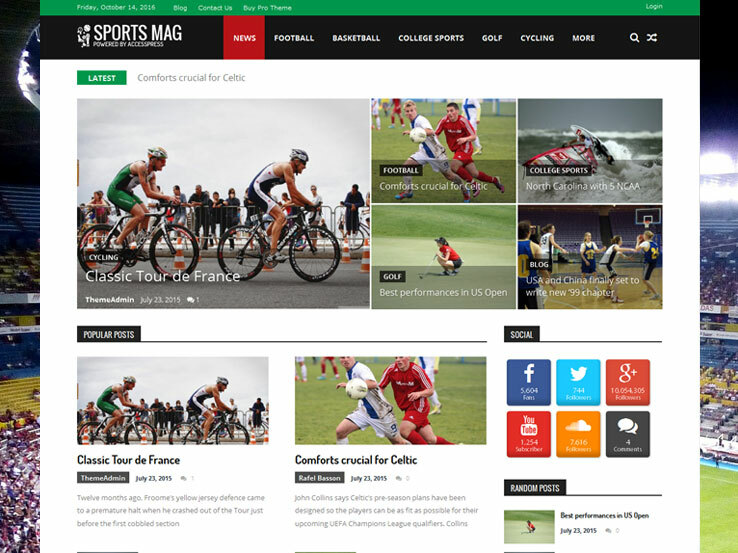 The MH Sports theme offers a colorful blog layout for generating a sporting magazine. 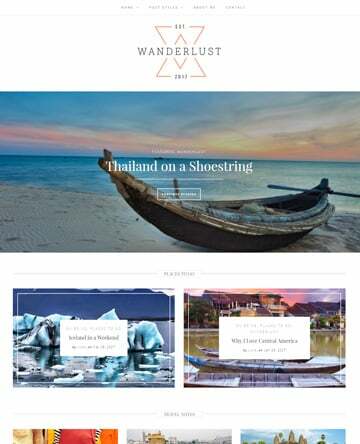 The fresh design delivers a wonderful color scheme, and the blog allows you to present editorials and other new articles with the help of widget areas and interesting typography elements. A few custom widgets improve the theme, such as the advertisements or recent post lists. In addition, all of the new blog posts reveal large, featured images, and bold titles and descriptions. 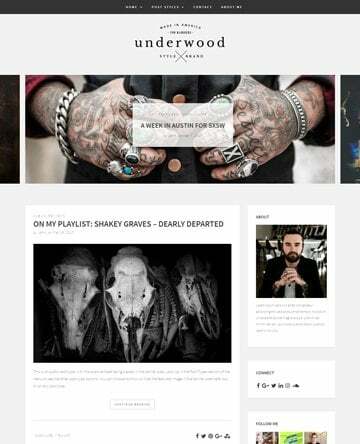 The custom background blends in nicely with the custom header, and the custom menu manages how users get around your site. A full-width template expands the space given to fit in your content, while the left and right sidebars consolidate and organize the widgets you decide to use. RTL language support comes standard, and the threaded comments ensure that you can have conversations with your customers. Not to mention, the MH Sports theme is translation ready. 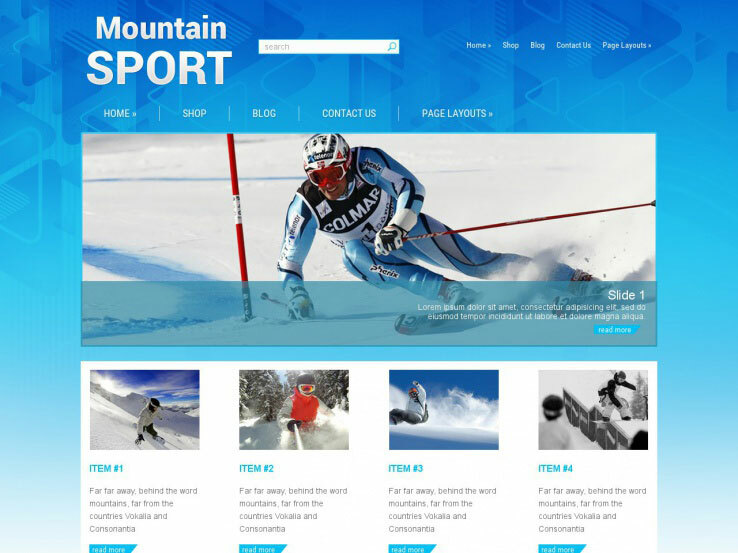 The Mountain Sport theme focuses on winter sports, and it provides the necessary tools and designs for shops and blogs that cater to skiers, snowboarders, and other winter sports fanatics. The theme offers translation ready options for localizing your website, and you get a responsive design with video support. The related posts keep people on your page for a longer period of time, while the page templates add a little variety to your site. The custom drop down menus boost the overall user experience, and the custom logo helps with branding. A social sharing bar comes along with the theme, and you get other items such as SEO optimization, shortcodes, demo content, and custom widgets. The threaded comments come in handy, while the WooCommerce support accumulates money when you make sales. Other than that, you receive a custom contact form and a Google Maps integration. 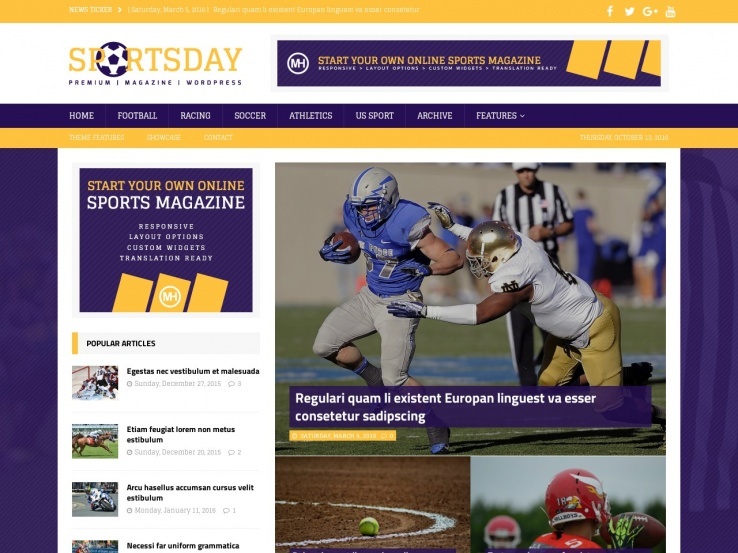 The Sports Mag WordPress theme presents yet another way to build a magazine for sporting events or teams. The full magazine homepage looks similar to something you would get for a premium price, with social media buttons, recent article lists, and more. The beautiful article page intrigues visitors, while the YouTube video lists ensure that users get a little bit of both written and video content. Responsive ads and Google AdSense both work nicely with the Sports Mag theme, and the homepage grid view delivers a way to organize your many articles into sections. The translation panel is a nice bonus, while the social media integration includes both sharing and following buttons. Along with that, you gain access to features like a commenting system, author box, blog, breadcrumbs, sidebars, and featured posts. It’s a wonderful sports theme for the serious magazine company. Consider the 24Soccer theme if you’re trying to blog about soccer. Although the soccer defaults come standard, you can change these around to write about any sport. That said, some of the features include custom menus, related posts, and antispam. In addition, you get SEO optimization, a slider, and translation options. Built on the SMT Framework 2.0, the 24Soccer theme delivers several options for selling digital or physical products. 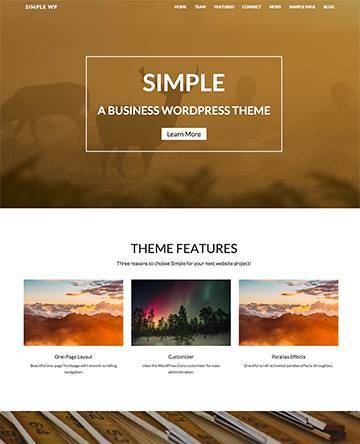 For example, the theme lets you integrate with the WooCommerce and Ecwid plugins, both of which run smooth on WordPress. 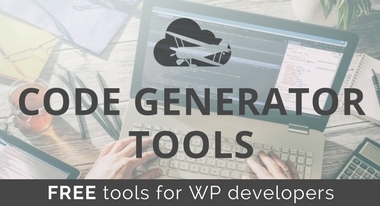 The theme has a dynamic content loader, and it provides custom sidebars for placing widgets. The Google Maps shortcode serves as the only built-in shortcode. However, the theme provides support for other custom shortcodes and widgets. Finally, the responsive design looks wonderful, especially with the included Contacts page. 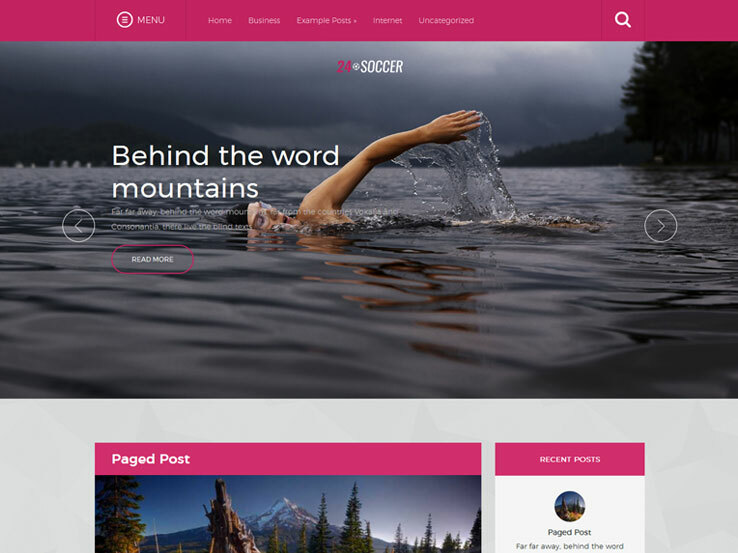 The Sportswear WordPress theme offers a solid set of features, starting with the fact that it’s built on the SMT Framework 2.0. 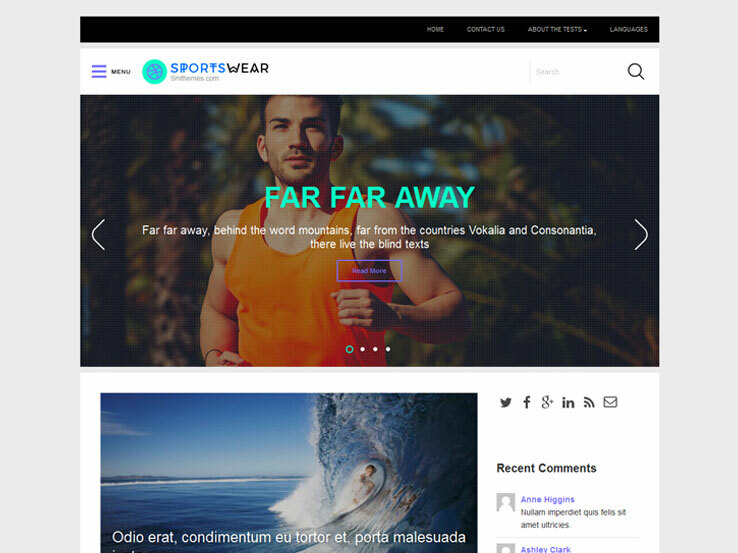 Constructed for selling sportswear, this theme provides a nice set of integrations, including for Ecwid and WooCommerce. A dynamic content slider spins through your most important content, and the custom sidebars support custom widgets. You even get a Google Maps shortcode, which is something you would generally have to pay extra for. The responsive web design keeps people happy when viewing on mobile devices, and the social sharing bar links to places like Facebook and Twitter. A Contacts page comes with the theme, and translation options expand your reach to around the world. Other slider plugins work with the Sportswear theme, yet you could also utilize the built-in one. Related posts come with the blog, and you can utilize the antispam feature for the best protection. A few other features include custom menus and SEO optimization. 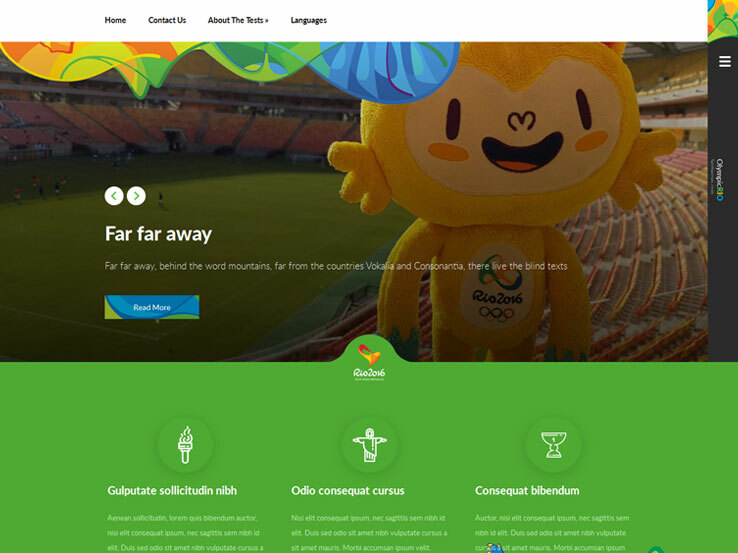 As one of our favorite free sports WordPress themes, the OlympicRio solution presents a design that looks similar to the Rio Olympics branding. That said, you can still modify the colors and adjust the styles for your own sporting magazine or blog. We also like the theme for selling sporting products and organizing events, considering it combines well with Ecwid, WooCommerce, and some scheduling plugins. Made using the SMT Framework 2.0, the OlympicRio theme provides a dynamic content slider, along with custom sidebars that pair well with the widgets. A Google Maps shortcode generally goes on the included Contacts page, while the responsive web design ensures that users see all of your content on mobile devices. Feel free to integrate with other shortcode plugins, and utilize the social sharing bar to build buzz. Some of the features include related posts, SEO optimization, and translation tools. With the Sporting theme you get a clean design for any of your sport website needs. For example, it could be used for information about a sports team, or you could run a blog or eCommerce shop. 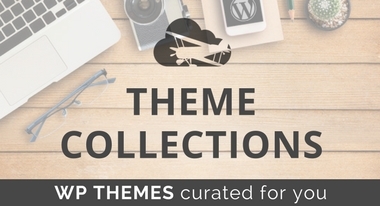 Similar to many of the free themes on this list, this one is built with the SMT Framework. 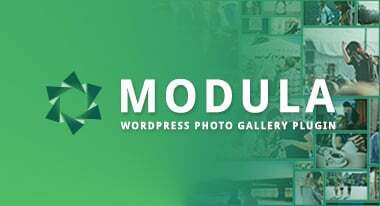 The theme integrates with the Ecwid and WooCommerce plugins for selling merchandise, while it also offers related posts towards the end of your blog posts. The antispam is sure to keep intruders away from your site, while the custom menus show users where to go when they land on your site. The SEO optimization comes standard, and the built-in slider can be replaced with a plugin if needed. Translation options are packed into the theme, and a Contacts page connects you with readers. The social sharing bar is something you don’t always see on free themes, while the responsive layout is more typical. 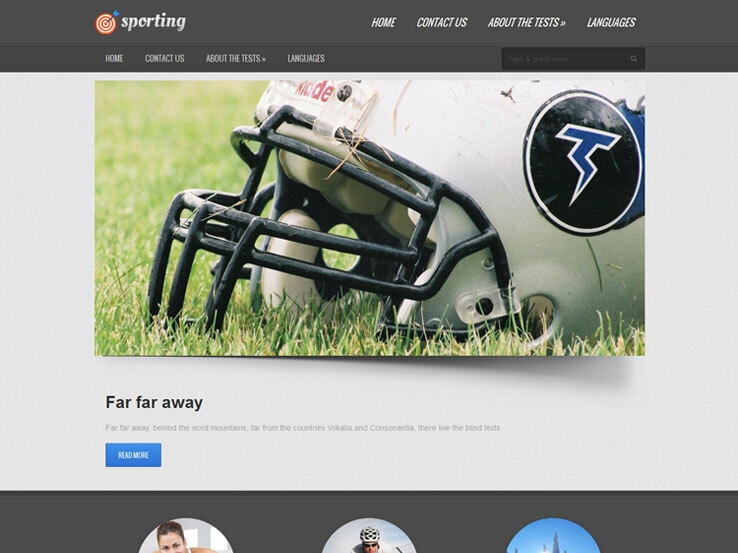 Along with shortcodes, custom widgets, and more, we consider the Sporting theme a touchdown.